Paroxysmal nocturnal hemoglobinuria (PNH) is an acquired chronic disorder characterized by a triad of clinical features - hemolytic anemia, pancytopenia, and thrombosis. Not many reports of renal involvement in PNH are available in literature. We present a case series of PNH with renal involvement. We present the data of PNH patients who attended to Departments of General Medicine and Nephrology at a government-run tertiary care institute in South India. The diagnosis of PNH in these patients during initial phase, between 1998 and 2004 was based on sucrose lysis and Ham's test. After 2004, the diagnosis was based on flow cytometry to detect CD59 (membrane inhibitor of reactive lysis), a glycoprotein, and CD55 (decay accelerating factor) in regulation of complement action. The patient data were collected from 1998 to 2014. There were 14 patients of PNH in this period. The mean age was 37 years and the range was 16–68 years. There were eight females. Acute kidney injury (AKI) was noted in six patients. Dialysis was performed in four of them. The mean serum creatinine and urea at the initiation of dialysis were 5.4 ± 0.6 and 64.1 ± 6.1 mg/dl, respectively. The median number of hemodialysis sessions done was four. Renal biopsy was done in four patients. In three patients, the urinalysis and serum chemistry were suggestive of Fanconi syndrome. In our patients, three renal manifestations of PNH were identified. They were AKI, renal vessel thrombosis, and Fanconi syndrome. Chronic renal failure was not identified. Paroxysmal nocturnal hemoglobinuria (PNH) is an acquired chronic disorder characterized by a triad of clinical features - hemolytic anemia, pancytopenia, and thrombosis. However, even in the absence of one or more of these manifestations a conclusive diagnosis can be made by appropriate laboratory investigations. PNH has an estimated prevalence of 1–1.5 patients per million population. The diagnosis is often made in East Asian countries, but it is not certain whether the incidence is greater in this region. The prevalence in India is not known. From a series  in England of eighty consecutive patients, the median age at the time of diagnosis was 42 years (range, 16–75 years). In an Indian series, the age was reported to be 26.09 years (range, 16–42 years). There is a tendency to male preponderance. PNH arises from a somatic mutation involving a gene on the X chromosome which codes for a protein involved in the assembly of phosphatidylinositol glycan (PIG), which anchors many proteins to the surface of cell membranes. Due to shortage of PIG, the two protective proteins which inactivate complement complexes, decay accelerating factor (DAF; CD55) and membrane inhibitor of reactive lysis (MIRL; CD59) are absent in PNH red cells, which then become sensitive to lysis by complement. The association of PNH and kidney disease was first recognized in the early 1970s. Subsequently, a high incidence of functional and anatomic renal abnormalities among PNH patients was documented. While these renal abnormalities in PNH are prevalent, they appeared to be generally mild and may not be brought to medical attention, apart from a few patients presenting with acute kidney injury (AKI). Not many reports of renal involvement in PNH are available in literature. We present a retrospective case series of PNH with renal involvement. We present the retrospective analysis of the data of PNH patients who attended to the Departments of General Medicine and Nephrology at a government-run tertiary care institute in South India. The patients' data were maintained on an out-patient case record. The diagnosis of PNH in these patients during initial phase, between 1998 and 2004 was based on sucrose lysis and Ham's test. The sucrose lysis test uses the ionic strength of serum that is reduced by adding an iso-osmotic solution of sucrose, which then activates the classic complement pathway, and complement-sensitive cells are lysed. The Ham test (acidified serum lysis) establishes the diagnosis of PNH, demonstrating a characteristic abnormality of PNH red blood cells (RBCs) by acidified fresh normal serum. Patient's RBCs lysed by normal serum at room temperature and at 37°C compared with normal red cells (no hemolysis). When serum is heated at 56°C, it inactivates complement and prevents hemolysis in RBCs of PNH. After 2004, the diagnosis was based on flow cytometry to detect CD59 (MIRL), a glycoprotein, and CD55 (DAF) in regulation of complement action. Absence or reduced expression of both CD59 and CD55 on RBCs of PNH is diagnostic. Flow cytometry was done in some patients who were previously diagnosed based on sucrose lysis and Ham's test. The conventional definition of AKI(ARF) – “a significant decline in renal excretory function over hours or days” and also AKI network classification were utilized. Renal biopsy was done in four patients to identify the cause of AKI. Fanconi syndrome was diagnosed when there were excessive losses of amino acids, glucose, phosphate, bicarbonate, and other substrates handled by proximal tubules with glomerular function not primarily affected. When urine pH in such a patient was >5.5, renal tubular acidosis was provisionally diagnosed. If urine pH was <5.5 in such a patient, sodium bicarbonate infusion was given till the serum bicarbonate reaches 24 mmol/L and fractional excretion of bicarbonate (FEHCO3) was measured using the formula, urine bicarbonate X plasma creatinine divided by plasma bicarbonate X urine creatinine multiplied by 100. When FEHCO3 was more than 15%, proximal renal tubular acidosis was diagnosed. The patient data were collected from 1998 to 2014. There were 14 patients of PNH in this period. The mean age was 37 years and the range was 16–68 years. There were eight females. These patients had symptoms for 370.5 ± 61.8 days before their presentation to our institute. All of them were diagnosed with PNH before presenting with a renal manifestation. The sucrose lysis test and Ham's test were positive in all patients. The flow cytometry for reduced expression of CD59 (MIRL), a glycoprotein, and CD55 (DAF) was positive in all nine patients in whom it was done. Bone marrow examination was done in five patients as a part of investigations for the diagnosis of PNH. It was similar in all of them. Bone marrow was hypercellular. Erythroid:myeloid ratio was about 2:1. Erythropoiesis was normoblastic to megaloblastic and hyperplastic. Granulopoiesis was normal. Megakaryocytes appear normal. Iron stain showed absent hemosiderin due to depleted iron stores probably due to prolonged loss of RBCs in urine. 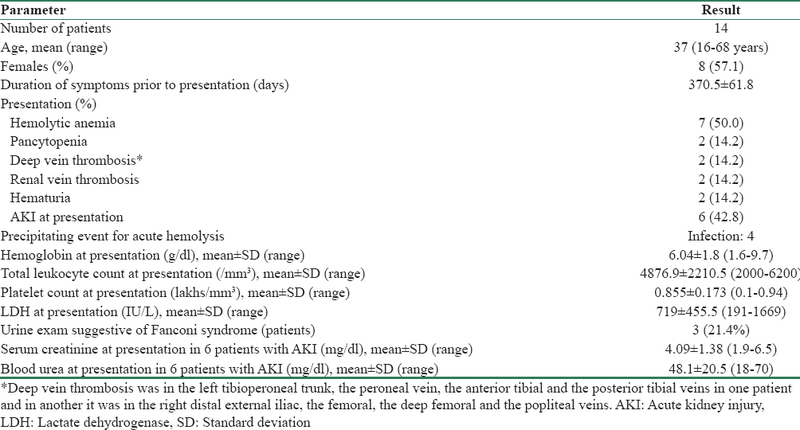 AKI was noted in six patients (42.8%) [Table 1]. Dialysis was performed in five of them (35.7%). The mean serum creatinine and urea at the initiation of dialysis were 5.4 ± 0.6 mg/dl and 64.1 ± 6.1 mg/dl, respectively. The median number of hemodialysis sessions done was four. Renal biopsy was done in four patients. The indication for the biopsy was AKI of more than 4 weeks. The median number of glomeruli was 9. The tubules showed prominent brown granular pigment within the epithelial cells. It was confirmed as hemosiderin with the Perls' Prussian blue reaction. A few deposits of hemosiderin were also seen within the tubular lumina. The pathological diagnosis in these four patients was acute tubular necrosis secondary to hemosiderin deposition at least in three of them [Table 2]. At the end of three months after discharge, all patients had normal renal function. There was no hematuria. In two patients (14.2%), there was unilateral renal vein thrombosis. Both of them presented with flank pain and macroscopic hematuria. There was no renal impairment. The values of serum creatinine in them were 1.0 and 1.1 mg/dl. In both of them, anticoagulation was started. Unfractionated heparin was first administered. It was overlapped with warfarin (a synthetic derivative of dicoumarol). The international normalized ratio was maintained between 2.0 and 3.0. Warfarin was continued for 6 months. There was partial recanalization of renal veins in both the patients. In three patients (21.4%), the urinalysis and serum chemistry were suggestive of Fanconi syndrome. The median urine pH in these patients was 6.0 while the median serum pH was 7.25 and the median serum bicarbonate was 16.5 mmHg. The diagnosis was confirmed by FEHCO3. It was more than 15% in all the three patients. These three patients were treated with oral sodium bicarbonate supplementation. During follow-up, none of our patients evolved to aplastic anemia, myelodysplastic syndrome or acute myeloid leukemia. The diagnosis of PNH was established in all of our patients. Sucrose lysis test, Ham's test, and flow cytometry were used to diagnose PNH. In our patients, three renal manifestations of PNH were identified. They were AKI, renal vessel thrombosis and Fanconi syndrome. Chronic renal failure (CRF) was not identified in any of our patients. In a report of seven patients of PNH with AKI, hemolysis was reported in six of them. Acute hemolytic episodes are often precipitated by nonspecific factors, such as infections, exercise, transfusion, reactions to drugs, immunizations and surgery. It is also reported after gastroenteritis. However, acute hemolysis could also happen in the absence of infection. The role of hemosiderin accumulation in renal tubules as a result of hemolysis and hemoglobinuria, in acute renal toxicity is controversial. It is because intense renal tubular hemosiderosis had been reported in postmortem findings among PNH patients, irrespective of renal function during life  and recovery from AKI is not associated with disappearance of renal hemosiderin. The other possible mechanisms of AKI in PNH are toxicity of both stromal and free hemoglobin to renal tubules,, intrarenal vasoconstriction due to pigments scavenging the vasodilator nitric oxide in renal microcirculation, and intratubular obstruction.,,, Bilateral renal vein or artery thrombosis is another cause in PNH. It is not reported frequently., Thrombosis in PNH could be due to impaired fibrinolysis, because the urokinase plasminogen activator receptor is a GPI-linked protein; more likely, complement activation could cause hypercoagulability, or hyperactivity of platelets or both. In our patients, renal biopsy in four patients with AKI revealed acute tubular necrosis due to hemosiderin deposition. The etiological diagnosis of AKI in the remaining patients could not be determined. All six patients recovered with serum creatinine declining to normal values. Fanconi syndrome is the third renal manifestation of PNH. Iron and hemosiderin deposits occur mainly in proximal tubules and to a lesser degree in the loop of Henle and interstitium.,, In animal models of experimental hemosiderosis, a decreased glomerular filtration rate (GFR) associated with tubular dysfunction is almost always present. Not many patients of Fanconi syndrome due to PNH have been reported in the past. In a previous report, a 51-year-old female had PNH diagnosed 17 years earlier. She had received multiple blood transfusions because of hemolytic episodes. The kidney function deteriorated and persistent Fanconi syndrome became evident. Laboratory studies showed proximal renal tubular acidosis, hypophosphotemic hyperphosphaturia, normoglycemic glucosuria, and aminoaciduria., In three of our patients, there was systemic metabolic acidosis, but the median urine pH was 6.0. The FEHCO3 was more than 15%, suggesting the diagnosis of proximal renal tubular acidosis. These patients were also found to have glycosuria, phosphaturia, uricosuria, and aminoaciduria. In two patients, there was unilateral renal vein thrombosis. In an analysis  of all patients of PNH, from 1953 to 2006, the renal vein thrombosis was observed in 12 of 363 patients (3.3%). It was the second least common site of thrombosis. At present, anticoagulation therapy is the cornerstone of the treatment for the renal vein thrombosis. The mechanisms of CKD in PNH are manifold. Incorporated iron has been proposed to exert a permanent local nephrotoxic effect on proximal tubular epithelial cells resulting in tubular atrophy and interstitial fibrosis.,, In addition, it has been proposed that the CKD could be due to repeated episodes of micro infarctions as a result of repeated episodes of microvascular thrombosis., There are a few case reports of CKD in PNH; but in majority of them, the diagnosis of CKD was not clear cut. In a report, a 74-year-old male with PNH developed acute on CKD after an episode of intercurrent urinary tract infection and subsequent hemolytic crisis. The decline in GFR was believed to be secondary to mild chronic hemolysis. A magnetic resonance imaging also demonstrated marked siderosis of both kidneys, supporting the hypothesis that CKD was related to PNH. However, a renal biopsy revealed acute tubular necrosis, distinct renal siderosis, tubulointerstitial injury and global glomerular sclerosis, best classified as arterionephrosclerosis, were present. In retrospect, these findings were explained by a 15-year history of hypertension and a 4-year medication with cyclosporine he used. Another 70-year-old male with a diagnosis of chronic idiopathic thrombocytopenic purpura had presented with low hemoglobin. He was found to have PNH. The patient was adequately hydrated and put on prednisone at a dose of 1 mg/kg. The patient had a regular follow-up for several weeks and maintained normal renal parameters. In another report, a 49-year-old male with the diagnosis of aplastic anemia was found to have had dark colored urine for 10 months. Investigations revealed PNH. He was treated with packed RBC transfusion and also received two sessions of hemodialysis. He continued to have normal renal parameters 10 weeks after the illness. There was a report of a 60-year-old renal transplant with PNH. Post renal transplantation the hemolytic activity reduced. The patient became transfusion-independent. In conclusion, it is said that kidney function is seldom severely affected in PNH; however, unlike other acquired hemolytic anemias, PNH may be lifelong and this is important in our recognition of renal manifestations. The treatment of PNH on one hand is supportive management like transfusion of filtered red cells, folic acid supplements and a short course of steroids only in an episode of massive hemoglobinuria and on the other hand it is allogeneic bone marrow transplantation. A major advance in the management of PNH has been the introduction of complement blockade by the use of eculizumab, an antibody specific for the C5 component of complement. Issaragrisil S, Leaverton PE, Chansung K, Thamprasit T, Porapakham Y, Vannasaeng S, et al. Regional patterns in the incidence of aplastic anemia in Thailand. The Aplastic Anemia Study Group. Am J Hematol 1999;61:164-8. Hillmen P, Lewis SM, Bessler M, Luzzatto L, Dacie JV. Natural history of paroxysmal nocturnal hemoglobinuria. N Engl J Med 1995;333:1253-8. Koduri PR, Gowrishankar S. Paroxysmal nocturnal haemoglobinuria in Indians. Acta Haematol 1992;88:126-8. Kruatrachue M, Wasi P, Na-Nakorn S. Paroxysmal nocturnal haemoglobinuria in Thailand with special reference to as association with aplastic anaemia. Br J Haematol 1978;39:267-76. Rosse WF. Paroxysmal nocturnal hemoglobinuria as a molecular disease. Medicine (Baltimore) 1997;76:63-93. Paillard M. Renal tubular acidosis. In: Davison AM, Cameron JS, Grunfeld JP, Kerr DN, Ritz E, Winearls CG, editors. Oxford Textbook of Clinical Nephrology. 2nd ed. Oxford: Oxford University Press; 1998. p. 1063-84. Jose MD, Lynn KL. Acute renal failure in a patient with paroxysmal nocturnal hemoglobinuria. Clin Nephrol 2001;56:172-4. Crosby WH. Paroxysmal nocturnal hemoglobinuria: Relation of the clinical manifestations to underlying pathogenic mechanisms. Blood 1953;8:769-812. Chan WL, Tang NL, Yim CC, Lai FM, Tam MS. New features of renal lesion induced by stroma free hemoglobin. Toxicol Pathol 2000;28:635-42. Braun SR, Weiss FR, Keller AI, Ciccone JR, Preuss HG. Evaluation of the renal toxicity of heme proteins and their derivatives: A role in the genesis of acute tubule necrosis. J Exp Med 1970;131:443-60. Jackson GH, Noble RS, Maung ZT, Main J, Smith SR, Reid MM. Severe haemolysis and renal failure in a patient with paroxysmal nocturnal haemoglobinuria. J Clin Pathol 1992;45:176-7. Mooraki A, Boroumand B, Mohammad Zadeh F, Ahmed SH, Bastani B. Acute reversible renal failure in a patient with paroxysmal nocturnal hemoglobinuria. Clin Nephrol 1998;50:255-7. Forman K, Sokol RJ, Hewitt S, Stamps BK. Paroxysmal nocturnal haemoglobinuria. A clinicopathological study of 26 cases. Acta Haematol 1984;71:217-26. Dunn P, Shih LY, Liaw SJ. Paroxysmal nocturnal hemoglobinuria: Analysis of 40 cases. J Formos Med Assoc 1991;90:831-5. Hutt MP, Reger JF, Neustein HB. Renal pathology in paroxysmal nocturnal hemoglobinuria. An electron microscopic illustration of the formation and disposition of ferritin in the nephron. Am J Med 1961;31:736-47. Hsiao PJ, Wang SC, Wen MC, Diang LK, Lin SH. Fanconi syndrome and CKD in a patient with paroxysmal nocturnal hemoglobinuria and hemosiderosis. Am J Kidney Dis 2010;55:e1-5. May ME, May EE, Parmley RT, Spicer SS, Buse MG. Renal impairment in experimental hemochromatosis in rats. Horm Metab Res 1983;15:194-6. Ziakas PD, Poulou LS, Rokas GI, Bartzoudis D, Voulgarelis M. Thrombosis in paroxysmal nocturnal hemoglobinuria: Sites, risks, outcome. An overview. J Thromb Haemost 2007;5:642-5. Paller MS. Hemoglobin-and myoglobin-induced acute renal failure in rats: Role of iron in nephrotoxicity. Am J Physiol 1988;255(3 Pt 2):F539-44. Zhou XJ, Laszik Z, Wang XQ, Silva FG, Vaziri ND. Association of renal injury with increased oxygen free radical activity and altered nitric oxide metabolism in chronic experimental hemosiderosis. Lab Invest 2000;80:1905-14. Braren V, Butler SA, Hartmann RC, Jenkins DE. Urologic manifestations of paroxysmal nocturnal hemoglobinuria. J Urol 1975;114:430-4. Vanwalleghem J, Zachée P, Kuypers D, Maes B, Coosemans W, Pirenne J, et al. Renal transplantation for end-stage renal disease due to paroxysmal nocturnal haemoglobinuria. Nephrol Dial Transplant 1998;13:3250-2.